Billet aluminum and stainless steel top yoke nut to fit to fit the Honda GB and CB series. 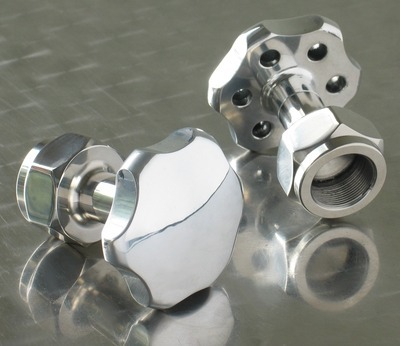 Billet aluminum and stainless steel top yoke nut to fit the the Honda GB500, GB400, GB250, CB350, CB400, CB450, CB500, CB550, & CB750 SOHC models. This may fit other Honda models. It replaces Honda OEM part #90304-323-670. Reminiscent of a steering damper off a British cafe racer from days gone by. 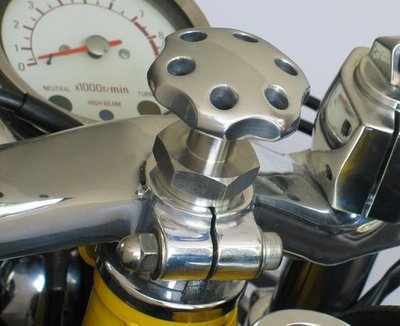 This top yoke nut will give your Honda a classic cafe racer look. This is designed to be used with clip-on bars.